This post isn’t about whether or not one “should” or “should not” eat meat or eggs in general, as I’m deliberately avoiding that question. I also include a section about “vegetarian meats,” so to my vegetarian and vegan friends: Read on! And… over a thousand people have now joined the October Unprocessed challenge! Why don’t you join us? Our supermarkets, with their sterile, plastic-wrapped packages of pre-butchered meat, do an effective job of shielding us from the reality of where our food comes from. That means that the meat you’re eating may not be as unprocessed as you think it is. Hopefully, this post will help you walk into the grocery store with eyes wide open so you can better decide what’s right for you. Cold cuts and deli meats are going to vary widely, of course. The hard part in today’s world is that there are often a lot of shortcuts and other ingredients used to help speed their process, keep the product stable longer, or provide consistency and uniformity so that it’s the same every time you buy it, no matter where or when you buy it. Beef, Water, Corn Syrup, Contains Less Than 2% of Salt, Ground Mustard Seed, Potassium Lactate, Dextrose, Hydrolyzed Beef Stock, Sodium Lactate, Autolyzed Yeast, Sodium Phosphates, Sodium Diacetate, Sodium Ascorbate, Sodium Nitrite, Flavor, Extractives of Paprika, Oleoresin Celery Seed. Okay, so that was too obvious an example. So how about Applegate’s Roasted Chicken Breast deli slices? Chicken Breast, Water. Contains Less Than 2% Of The Following: Honey, Salt, Potato Starch, Carrageenan (From Seaweed). The bottom line for cold cuts and deli meats? You’ll need to read the ingredients carefully and make sure each passes the kitchen test. So how about cured meats — such as bacon or salami? People have been curing meats at home for thousands of years. You still can, for example, make pancetta, beef jerky, and other charcuterie at home. The challenge is that today’s store-bought cured meats may or may not pass the kitchen test — and most probably won’t. Just like the deli meats, you’re going to have read the ingredient list and decide if that particular option passes the test. Chicken, for example, is often injected with salt water and other additives to keep it “plump.” (Oh, and then they also get to charge you $4.99/pound for salt water.) 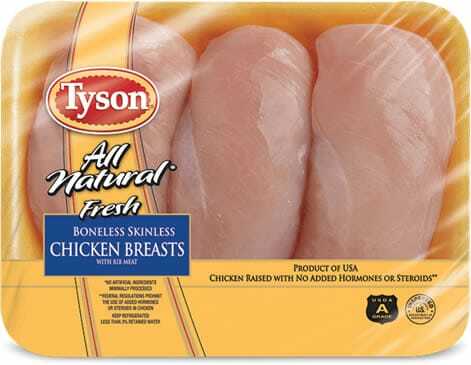 For example, the Tyson “All Natural Fresh Boneless Skinless Chicken Breasts” shown above actually have up to 15% — fifteen percent! — chicken broth, sea salt, and “natural” flavorings (which likely aren’t actually natural). Or consider ground beef. A pound of ground beef (that wasn’t ground by your local butcher), could actually contain meat from more than a hundred cows. That may not make much difference nutritionally, but it speaks to the degree of large-scale processing with which produce our food and the lack of transparency thereof. Eggs are yet another story. Whole eggs, still in the shell, aren’t being “faked” just yet, thankfully. Of course, if you’re using pre-cracked eggs (such as a carton of “Egg Beaters”), odds are it won’t pass the kitchen test. You’ll definitely need to read the full ingredient list for those (I can almost guarantee they’re going to have thickeners, stabilizers, and “natural” flavor). From the ingredient-based perspective of the kitchen test, the best bet is to read the label (if there is one) very carefully, buy meat directly from a farmer or butcher, and do your homework as best you can on that particular brand and product. There are many meat alternatives available now — far more than ever. Unfortunately, many of them are just as ultra-processed as what they’re trying to replace. From an ethical standpoint, I totally get it – you’re not killing animals for your food (that’s exactly what started me on this food journey, many years ago!). But from an unprocessed perspective (and what this challenge is all about), many of those aren’t great choices. The most common ingredient in modern meat substitutes is textured vegetable protein, or textured soy protein. The manufacturing process of TVP is fascinating (a testament to human ingenuity! ), but something you definitely couldn’t be doing at home. Pea protein (or more accurately, pea protein isolate) has become popular in the past couple of years as well, but you’re also not going to be making that at home. So how about the more “traditional” meat alternatives? Tofu usually passes the kitchen test, as you can make tofu at home (but double-check the ingredients, of course). Tempeh, made from cooked and fermented soy beans, is also truly traditional, and the ingredient list on store-bought tempeh tends to be clean (but again, double-check — especially the “flavored” varieties). Seitan is a gray area… You can make seitan at home from wheat flour, but at the commercial level it’s usually made with vital wheat gluten (which you can’t make at home), so I’ll leave that one up to you to decide. 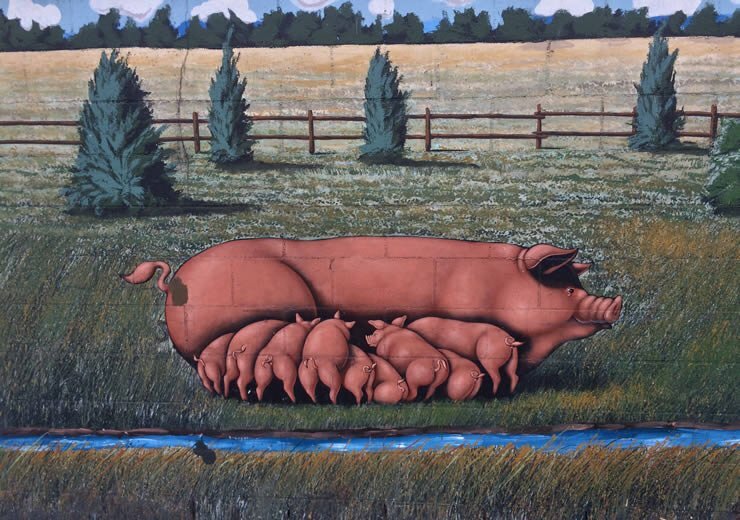 This mural is painted on the wall outside the Farmer John factory in Los Angeles. It’s a flat-out lie, playing into the modern myth that farm animals live in an idyllic setting. Some still do (read on! ), but not the ones that go into Farmer John sausage (if they did, I’m sure their website would make a point of it). Ultimately, I’ve found that beyond the “obvious” processing (such as when there actually is an ingredient list on the package), the best way to get “unprocessed meat” is to focus on the treatment of the animals while they’re still alive. How the animals are treated, how much space they have, if they’re indoors our out, if they can move freely, what they are fed, how they’re slaughtered, and what happens before it gets to you all makes a world of difference, both in the animals’ health (and therefore of the meat or eggs you’re eating), but also in the health of the planet.. and in your overall good Karma, too, of course. Take another look at my photo of the Farmer John mural above. When I drove past it, I was so appalled at the blatant lie that I actually got out of the car and took several photos. 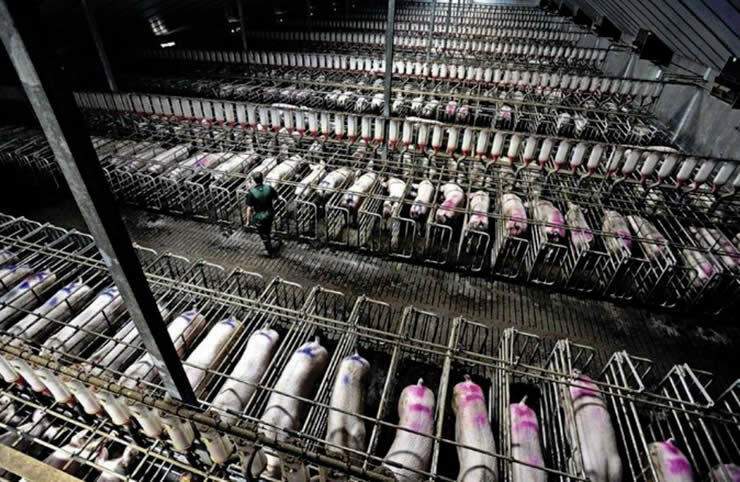 In reality, 9 out of 10 sows in America are locked in gestation crates where they are basically immobilized — for years. I tried to pick a photo that was a little on the less-graphic side… scrolling through the Google image search for “gestation crate” was absolutely sickening. Chicken isn’t usually much better, although at least chickens raised for meat aren’t usually confined to minuscule cages like their egg-laying counterparts so often are. Even so, the majority of the 9 billion chickens raised for meat in the US. each year live in crowded, dark, deplorable conditions on factory farms. 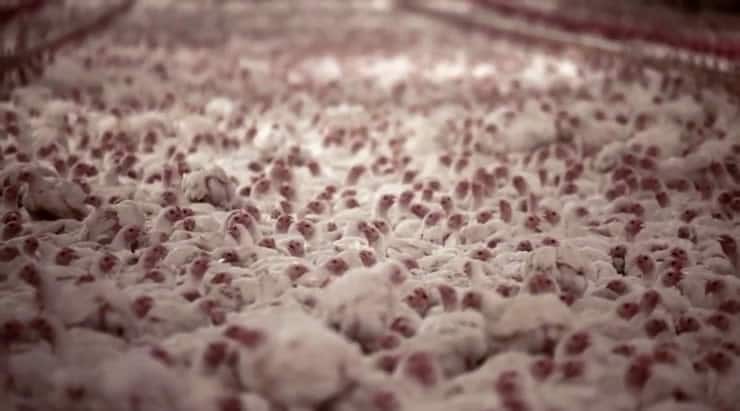 Selectively bred for rapid weight gain, today’s chickens are so over burdened by their bodies that they spend much of their short lives lying in their own waste. These conditions aren’t only bad for the chickens — they can also have negative implications for food safety. Chickens raised on factory farms often have open wounds, which can act as a gateway for bacteria like Salmonella. Farms routinely administer low doses of antibiotics to their chickens through their feed, in order to keep them alive and growing in such unhealthy conditions, which poses a risk to our health by creating new, antibiotic-resistant bacteria. For chicken and turkeys raised for meat, this means the birds have “access to the outside.” But the size, duration, and quality of space are not defined and vary considerably. It could be a small dirt patch on one side of a very large barn (and when I say very large, I’m talking about 30,000 chickens under one roof), that a chicken on the other side of the barn may never even knows exists. Unless it says 100% Grass-Fed, it means that the animals had access to pasture during the majority of their growth. Pretty much all cows are on pasture for the first portion of their lives, and are then moved to feedlots for “finishing,” so just calling beef “Grass-Fed” is essentially meaningless. Even 100% Grass-Fed could mean the cows are getting grass while in a feedlot. All of these are unregulated, and do not necessarily impact farm animal welfare. Any company can make this claim, with nothing to back it up. 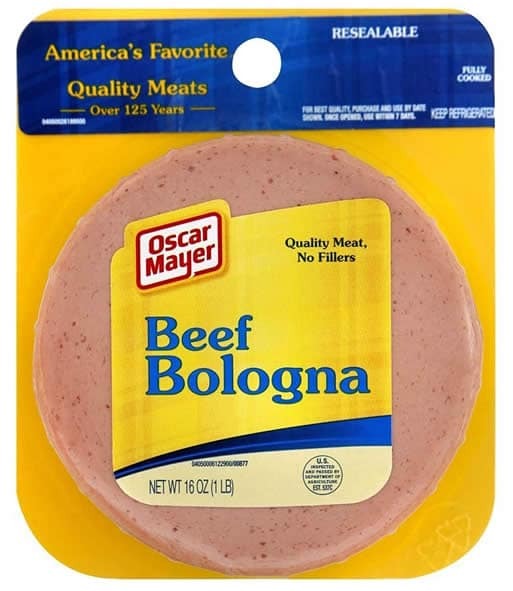 This implies that the USDA’s Food Safety and Inspection Service has officially evaluated a meat product for class, grade, or other product quality characteristics. This would be something like “Certified Angus Beef.” It has nothing to do with animal welfare, what the animal ate, and so on. This should not be confused with third-party welfare certifications. 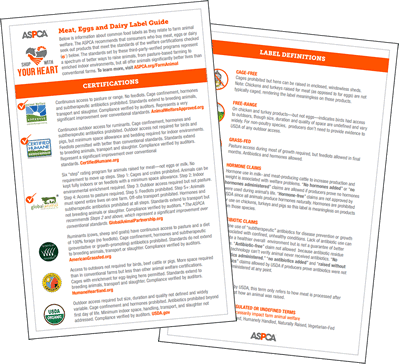 If I’m not buying direct from the farmer (such as Harvest Gathering Farms here in Los Angeles — tell Wendy I sent you), here are the certifications I’ll look for. The first three are the best, but any of these are better than nothing. This is the six “step” rating program for animals raised for meat–not eggs or milk–that Whole Foods Market uses. Step 1: Cages and crates prohibited. Animals can be kept fully indoors or on feedlots with a minimum space allowance. Step 2: Indoor environmental enrichment required. Step 3: Outdoor access required but not pasture. Step 4: Access to pasture required. not breeding animals or slaughter. My hope is that this post has encouraged you to start thinking about meat in a slightly different way than before. We live in a culture that makes this very difficult, but every step you take towards less-processed meat (however you define it — whether that’s “Step 5” meat, veggie hot dogs, or no meat/meat-alternatives at all), I hope you’ll be a little more empowered to make some deliberate choices in the coming weeks to do what’s right for you. Take this info with you! If you haven't taken the October Unprocessed pledge yet, please do! And then encourage your friends to join in -- it's a lot more fun that way! Photo of gestation crates by Kathy Stevens (I think). I love this Andrew!!! So informative, and articulately put without judgement. All these reasons is why my husband and I went pescatarian this year, leaning more towards vegetarian. We’ve tried the vegetarian meat alternatives, and I just don’t like them. Can’t wait for October Unprocessed! very informative & thorough! thanks for putting it out there. if you can, buy eggs and meat directly from local farmers who raise animals conscientiously. They are a lot more expensive, for sure. The way I see it though, I don’t buy or eat as much meat/chicken anymore. This year I only order six chickens from my local farmer (from whom I have been buying in the last 16 years); that’s all my family would eat in a year. 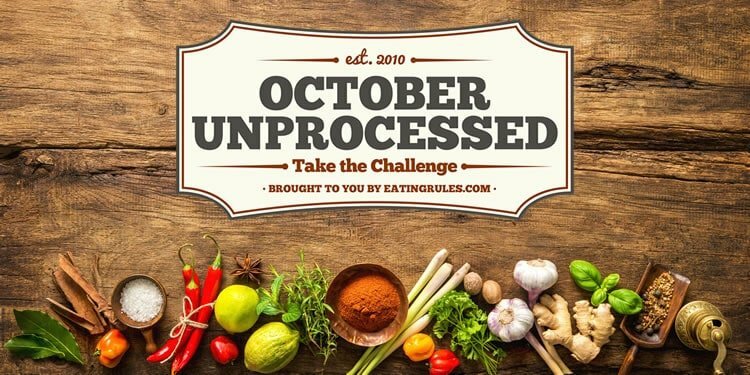 I’m excited to be a part of October unprocessed! I spent 20 years of my life raising grass-fed beef, pastured pork, and free-range eggs. Although the terminology is complicated and conflicting, I take heart that my customers could see my animals when they visited my farm and farm store. No antibiotics, or hormones. Occasionally we would need antibiotics for some type of infection, but the treated animals were separated from the main herd/flock.The animals always had a good life that they fully deserved. 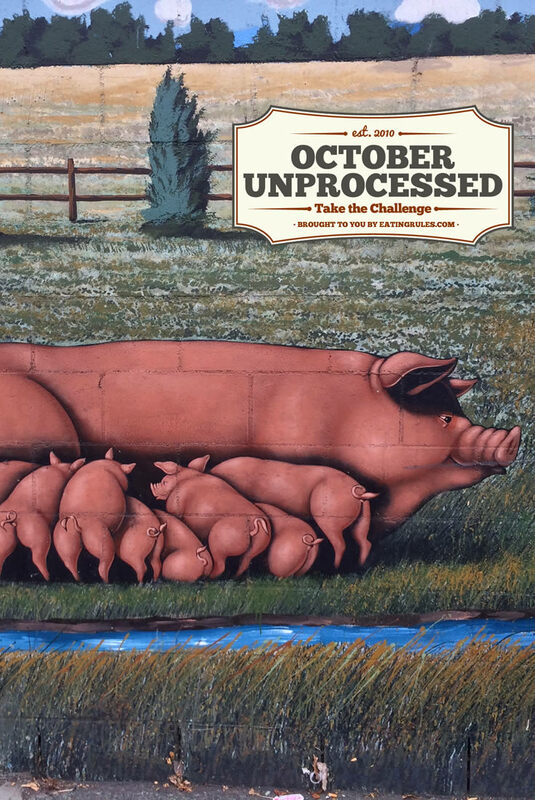 I feel that I am a conscientious consumer, but I’m excited about challenging myself with your “October Unprocessed “. Thank you! This is great Andrew! I’m really looking forward to reading past blog posts! Follow up to my first post. I’m going to get real here. I’m actually jealous of how beautiful, informative and well put together this post was. There, I said it! I’m in Ohio and deer hunting is common. Would you say most falls into the unprocessed category? I live in Kansas where we hunt for most of our meat. I would consider our deer meat as unprocessed because it goes directly from the field to the butcher. The only concern I have lately is that the deer are eating the crops that are almost always GMO. I’m willing to deal with it because the meat is unprocessed. I would say so. Venison and other game meats are “free range” as it gets!